Don't bathe and you'll have the entire car to yourself! I never have a problem. I bathe on Saturdays whether I need it or not; and I eat a lot of salami-type sausages, which usually includes some garlic in there somewhere. It must be that garlic. Those New Yorkers sure are smart! Supposedly garlic will keep the vampires away too... now if you were going to Gilroy- Garlic would probably be the required admission fee, thanks to the Garlic festival. 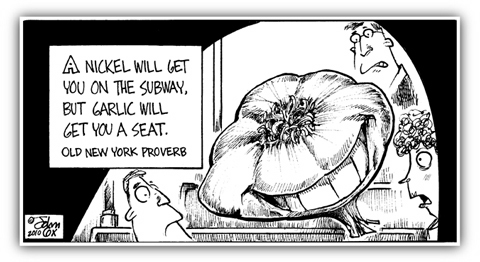 Garlic may get you a seat, but "silent but deadlies" (SBD*)will get you the whole car to yourself. * a noxious, putrid, gaseous anally-delivered posterior emission consisting of ammonia, hydrogen sulfide and a whole lot of other nasty stuff. I like the way the head of garlic has an "Audrey II" kind of vibe. With COWBOY's comment, that gives a whole new meaning to "Mean Green Mother (from Outer Space)" (my favorite song from that movie). I really dug Buddy Miles' voice. He didn't hold anything back. RIP, Mr. Miles. This page contains a single entry from the blog posted on January 7, 2010 6:55 PM. The previous post in this blog was Year One.